These are pretty, understated and elegant. It's another recipe from my Spring Raw e Book, but it's perfect for this time of year and makes a great treat for any holiday. To make them, dehydrate a cup of cherries. Just place on a lined dehydrator tray and dry for a few hours, until the cherries are shrunken but still pliable and not hard or brittle. In a food processor fitted with an “S” blade, process the almonds until finely ground. This takes a minute or so. Process again until the mixture begins to clump together. Using a tablespoon, scoop out even sized balls, and roll between hands to shape. 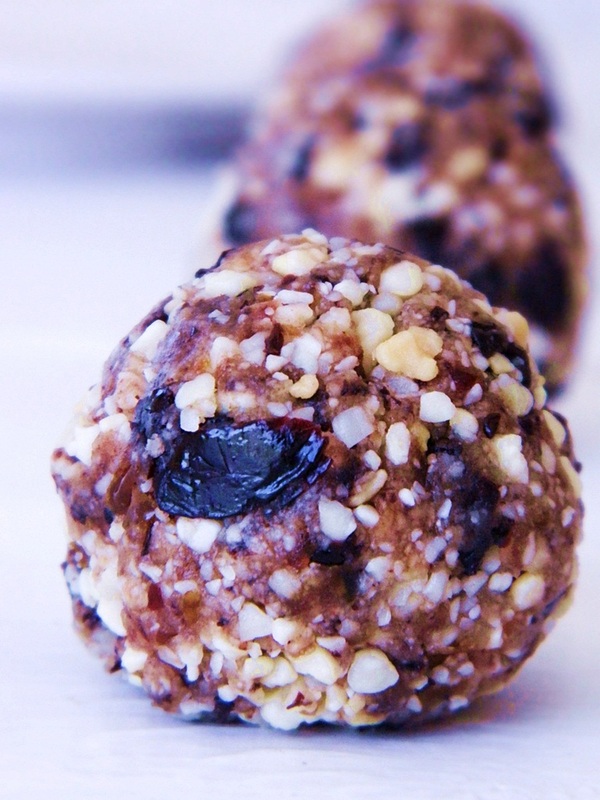 I may just need to make these for my Mom, she was just suggesting a cherry almond cookie ;)! Wonderful! I miss Travese City cherries...this reminds me of the large box my father-in-law shipped down to us from MI. several years ago.Wish I had some of those now to make these yummy balls. Hi Elizabeth, Traverse City cherries are one of my favorites, too! Where do you manage to get dried cherries that cheap? Hi Lisa, I bought them frozen and dehydrated them until they were kind of leathery. Much less expensive, and nothing but cherries.